"Placida notte, e verecondo raggio della cadente luna"... this is the start of one of the few poems I remember from my old school days. 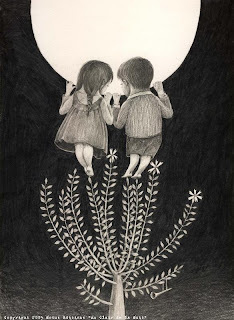 I won't talk about the reasons for the strong appeal the moon has always had on men, though it is a matter of fact: since ever men got inspired by it so as to make of it the object of adoration and superstition even. This year several books were published about the moon or men landing on it in 1969. 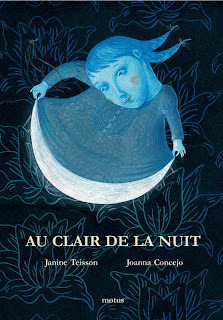 Au Clair de la Nuit, texts by Janine Teisson, illustrations by Joanna Concejo, collection "Pommes, Pirates, Papillons", Editions Motus, 2009. Au Clair de la Nuit is a little masterpiece of quality and care, holding it in your hands is really pleasing both for the rough and thick consistency of the paper, for its sober composition, and for the beautiful combination of text and illustrations that lead us to the discovery of new, poetical images. "On dit que la lune est pleine. Mais pleine de quoi?" - They say the moon is full. But full of what? The black and white images by Joanna Concejo increase from time to time the feeling of melancholy, they strengthen the poetical message from the texts, letting all the unsaid shine, letting us perceive the distance that separates us from the moon but also that closeness that makes us wonder when we look up. A book I suggest to everyone, to adults as well.